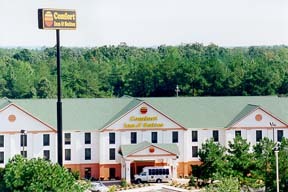 The Comfort Inn and Suites Atlanta Hotel College Park is located in College Park, Georgia and offers guests, be it business travelers or vacationers, the very best in suburban Atlanta hotel accommodations. The hotel’s central location coupled with its range of modern accommodation amenities makes it a favorite among experienced Atlanta visitors as well as first time visitors, arriving for the serenity and peace offered by the College Park environment. Guests staying at the Comfort Inn and Suites Atlanta Hotel College Park are provided with an array of modern accommodation and amenities for their convenience. These amenities and services include telephone with voicemail, free local calls, message center, Internet access, and cable television. In addition, the rooms at the Comfort Inn and Suites Atlanta Hotel College Park come with services that are designed for the convenience of business travelers. These include Internet access, computer hook-up and AT&T long distance access. Furthermore, this College Park Atlanta hotel is perfectly located to offer business travelers access to Georgia’s business corporations. Located within close proximity to the Comfort Inn and Suites Atlanta Hotel College Park include prominent Georgia business locations such as CNN Center, Georgia World Congress Center and Atlanta downtown. The Comfort Inn and Suites Atlanta Hotel College Park is also located ten minutes away from the Hartsfield International Airport, making it an ideal venue for business gatherings and meetings. The Comfort Inn and Suites Atlanta Hotel College Park offers guests the following amenities in all of the hotel guest rooms. Comfort Inn and Suites Atlanta Hotel College Park is within easily accessible distance from the Cajun Crab House, Malone's, Piccadilly Cafeteria and Red Lobster.